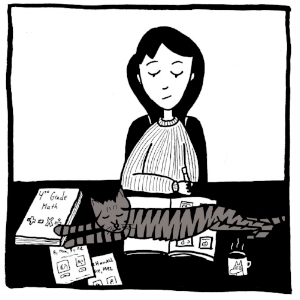 Rachel Comics is the autobiographical comics of Rachel Scheer, a comic artist living in Seattle, WA. Rachel comics are droll, humorous accounts of her life now, as a thirty-something living in Seattle, and stories from growing up in the Washington, D.C. area. Rachel has self-published mini comics for the past several years, including “In Between Naps,” a graphic adaptation of her high school diary; “By Mom, By Me: A Tale of Two Childhoods,” Rachel’s coming-of-age stories paired with her mother’s, 40 years earlier, in the Bronx, New York; “That Time I Met Bill Clinton…And He Stole My Favorite Pen,” a story about feminism, filching, and fanny packs in the White House when Rachel was 10; and “Yoga Diary,” six comic tales of the frustration and elation yoga has brought to her life. Rachel also works as a fourth grade teacher. Older Rachel Comics can be found in this archive.